It is 8:42am in the morning. We are dressed in our battle gear of Judging shirts and name tags. 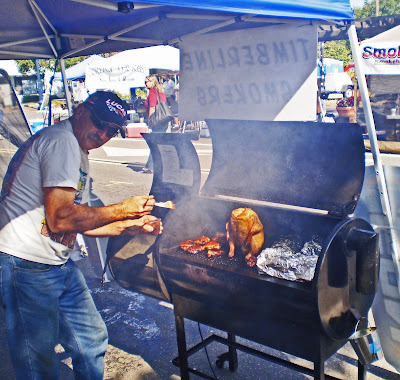 There is a short cut that brings us right through the ranks of the barbeque competitors. It is hours before the first turn in. All eyes are glued on Ms. Goofy and I as we march down the promenade. The first team says ‘hello’. They say hello while staring right through our brains. The next team lines up and salutes us with a gratuitous gracious hello. We nod and wave hello back. On and on it goes. Are we the enemy? 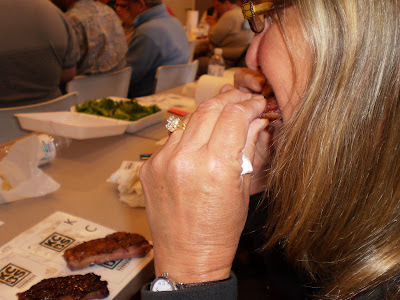 We are only KCBS judges here to taste some killer barbeque. “Boy, O, Boy”, did we taste some killer Q. In the last 24 hours we have judged, 3 contests and have tasted over 13 categories of turned in meat. I am going to have a meat baby! This was one great experience of meat critique and consumption. This was the West Coast BBQ Championships. Teams were competing for cash prizes and for qualification to national events. The judging took place in a shaded patio area. The weather was very pleasant. The thermometer rose to the high 80’s with a refreshing slight breeze. 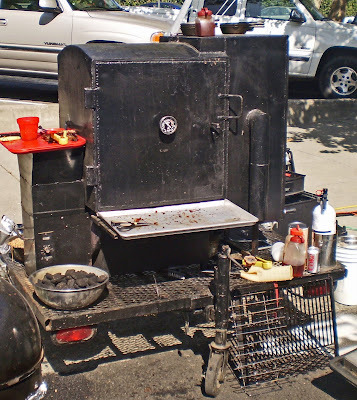 The KCBS runs a well oiled machine for judging barbeque events. We received our instructions and took an oath to uphold barbeque integrity. We felt proud reciting this pledge. We had a responsibility to give our honest opinions, to all the competitors that acknowledged us, on our journey to the Judging area. Words have left me at this moment. One reason is because, I am on the couch, with my baby. More pictures of some serious rigs and great competitors can be seen by clicking, CLICK HERE! I will get back to you soon with a review of a local hot sauce. Bye Yall. My dogs are giving me no rest either. Good luck dealing with the meat baby. 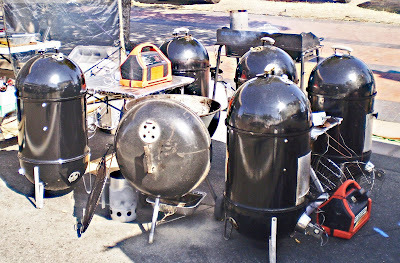 I love the custom rigs people put together for BBQ. Them guys are serious. I'm surprised by the Big Green Eggs. I used to lust after one but then I thunk it would be hard to do indirect cooking with one. 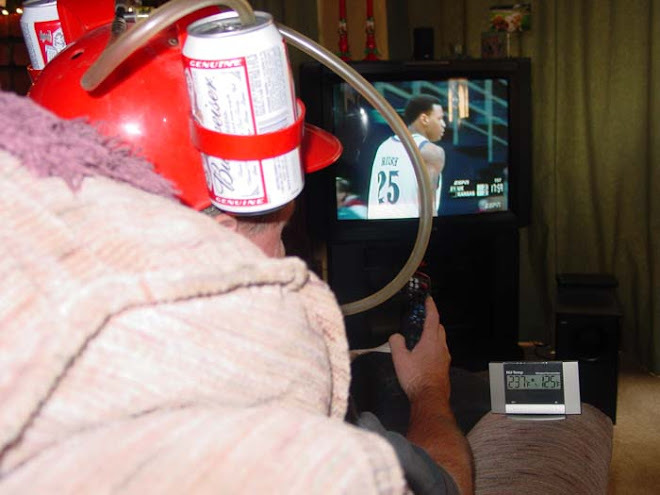 Looks like some have it figured out. Hey Greg, Sorry about being under the weather. 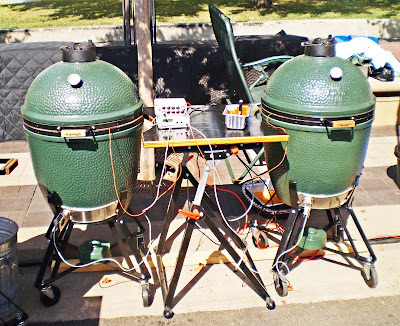 The Big Green Egg setups were very impressive. If you look at the pictures you will see wires and base stations. They monitor temperatures and will turn a fan on and off at the vents. You can hook it all up to a computer. You could set everything up the night before and return the next morning. I just had a quesadilla with leftover judging material. I had to feed the baby. I'm sorry I missed it, I could have been a meat star too! The hole in my foot is getting a lot better, still hurts though. Dumb foot. I think you have found your perfect calling - munch on! Reverend, We are glad your foot is gettng better. You allready are a MEAT STAR! 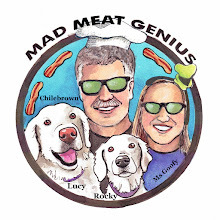 Zoomie, Ms. Goofy and I will wear our judge outfits and come over and score your planked chicken anytime. you brought home left over food from judging?!?!?!??! Don't let the cooks know. Many frown on that. But from one CBJ to another - welcome to the circus! Hey White Trash, I love saying that. Last year we could not take home leftovers. This year it was game on. I guess it depends on the sponsor. 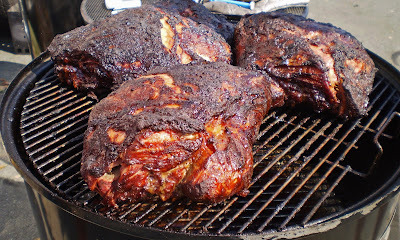 KCBS approved. I made the killer black bean chile with the left over brisket. Ms. Goofy and I are doing another competition Labor Day weekend. We are hooked!